Yesterday we published an update to our Death By Amazon index, which captures the performance of stocks which we judge as exposed to the rise of Amazon: traditional retailers, without their own brands, or without a focus on e-commerce or a dedication to specialty products that Amazon does not focus on. We’ve maintained these indices since 2014, and they haven’t always lagged badly. As shown in the chart below, the equal-weight version of the index actually outperformed the S&P 1500 dramatically until early 2015. Since then, the stocks have really lagged. Late in 2017 the index was flat versus where it stood almost 5 years earlier! While it has rebounded a bit over the last few months, the performance gap versus the broad S&P 1500 is still huge. More recently, we’ve also introduced an Amazon Survivors index. These stocks are retail still, but they have attributes which might help them resist the competition of the e-commerce giant: strong brand names they control, e-commerce focus, or a specialty product line where Amazon doesn’t compete (for instance, auto parts). 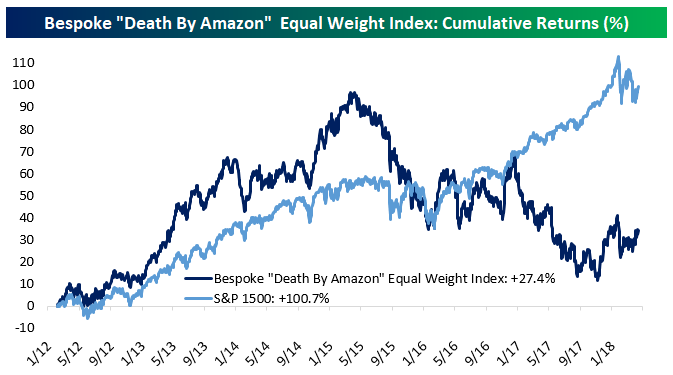 Since inception, this index has outperformed our Death By Amazon index quite dramatically. 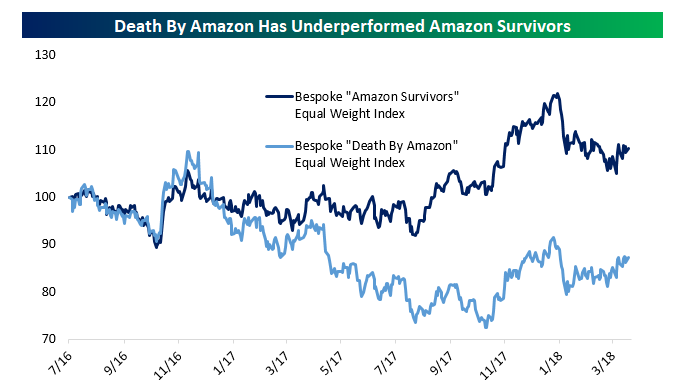 To see our most recent Death By Amazon report, which includes a list of the stocks that make up both the Death By Amazon and Amazon Survivors indices, you have to be a Bespoke Premium member or higher. You can see the report now with a two-week free trial to Bespoke Premium.